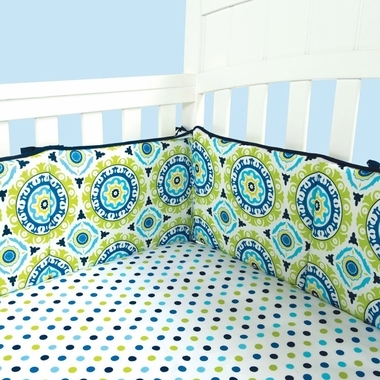 Add beautiful safety to the crib with this Waverly Solar Flair Crib Bumpers. It is dazzling with reversible sides featuring large multi-layer medallions in Macaw Green, Primrose Yellow, Linden Green, Sky Blue, Blueberry Blue and Sapphire Blue. 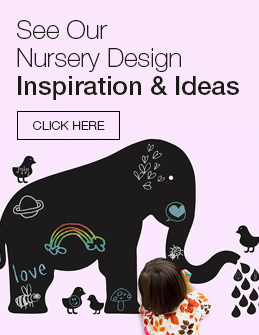 It is made of 100% cotton with thick polyester filling that provides baby with soft bumping. The trim and string ties are Blueberry Blue. Multiple ties at top and bottom keep the bumpers safely attached to crib rails. Comes in four sections. Machine wash with like colors. Coordinates with the Waverly Solar Flair Collection by Trend Lab.